The Woody Allen scandal: Can we separate the art from the person? At this year’s Golden Globe Awards, Woody Allen was awarded the 71st Cecil B. DeMille Award. This honor is bestowed each year on one individual, chosen by the board of directors of the Hollywood Foreign Press Association (HFPA), for “outstanding contributions to the world of entertainment” (Golden Globes). 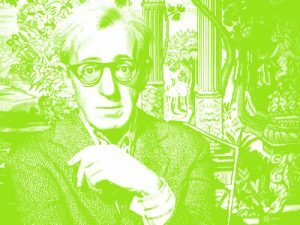 Woody Allen’s career as a screenwriter, actor and director spans more than 60 years, in which he has created 73 movies, including some of the most iconic films of that time – movies such as “Manhattan,” “Annie Hall,” and dozens more. It is hard to dispute, therefore, the claim that he has contributed, to an almost unparalleled extent, to the world of film, and is an icon of the industry. However, the award ignited a maelstrom of controversy, stemming primarily from one incident. In 1993 Allen was accused of sexually assaulting his adoptive daughter, Dylan Farrow, who was seven years old at the time. A police-appointed Yale medical team determined that Dylan was not molested, and the judge eventually ruled that the evidence was inconclusive. Despite the ruling, both Dylan and her mother have consistently stood by the allegation, supported by much of the public. As a lifelong admirer of Woody Allen, but one who is too young to remember the initial controversy, I was deeply upset by the story (which I had never heard before). After reading Dylan’s open letter describing her experience, published by New York Times columnist Nicholas Kristof in early February, I was forced to reexamine my perceptions of a man I used to consider one of my favorite filmmakers. I was moved and, to be honest, disgusted by the account, and I have subsequently followed the story closely, reading Allen’s response to Dylan’s letter, as well as reactions from bloggers and critics online. Two primary questions arise in my mind when considering this issue: First, can we separate an artist from his/her art? And secondly, should we? To accompany Dylan’s letter, Nicholas Kristof also wrote a column, criticizing the decision of the HFPA to honor Allen, arguing that “the standard to send someone to prison is guilt beyond a reasonable doubt, but shouldn’t the standard to honor someone be that they are unimpeachably, well, honorable?” On the surface this statement seems reasonable, but Kristof is missing an essential component in the question of guilt and innocence. Yes, its true that someone must be proven guilty beyond a reasonable doubt in order to be convicted, but what he does not clarify is that they must be proven guilty of the crime for which they are charged. Someone cannot be sent to prison for murder if they are found guilty of armed robbery, for example. Similarly, the standard to honor someone for “outstanding contributions to the world of entertainment” merely be that they have, in fact, made such contributions. The description of the Cecil B. DeMille award does not include a requirement that the recipient be ‘an unimpeachably good, trustworthy and unquestionably honorable individual.’ In fact, one of the award’s first recipients was Walt Disney, who is now generally acknowledged to have been a racist, sexist, anti-Semite. Yet it is hard to question that Walt Disney’s legacy in film, television and entertainment is profound, and has played a role in shaping American culture as we know it. So, in response to my first question, I believe the answer is yes, it is possible to recognize the work that an artist has created without necessarily liking or respecting all aspects of their character. The second question, of whether or not we should make that distinction, is less clear-cut. Because giving an award like the Cecil B. DeVille means more than just recognizing someone’s accomplishments, it means establishing the recipient as a leader and role model, and I remain unconvinced that Woody Allen is truly worthy of that privilege. Regardless of the fact that Allen was not convicted, Dylan’s firm and constant belief in the truth of her claims has clearly had a lasting and devastating impact on her life, and the life of her family. And when you look at the accusation in light of Allen’s ongoing relationship with Mia Farrow’s other adoptive daughter, Soon-Yi Previn (which is technically legal), it does little to bolster Allen’s moral credibility. I am not arguing that we should boycott all of Allen’s future movies, or write angry letters to the Oscars committee every time he is nominated. I don’t believe he deserves to be heckled and abused in public, as has happened recently. I think it is right that we acknowledge what a talented and brilliant artist he is, but that does not mean we need to celebrate him.